HOUSTON -- Rougned Odor put one leg up on a chair as he talked to a reporter, giving teammate Carlos Gomez the perfect pedestal to drape a replica WWE championship belt encrusted with dozens of plastic crystals across his knee. It was an appropriate gesture for the man who delivered the knockout blow to the Houston Astros in the 12th round on Monday night. Odor had three hits and three RBI, including a solo homer in the 12th inning that lifted the Texas Rangers to a 4-3 victory. "I always like to play against the Astros," he said. "I like to hit in this ballpark. I just like it. I feel really comfortable here." Odor launched his 31st homer over the short fence in right field off James Hoyt (1-1) to put Texas on top. "He's certainly hurt us a number of times over the last couple of years," Houston manager A.J. Hinch said. "He's a good hitter. He's a hitter that does damage. Certainly, against us, he comes up big at the worst times." Odor, who finished a triple shy of the cycle, has six home runs, six doubles and 19 RBI in 16 games against Houston this season. "When he sees a mistake he puts a great swing on it," manager Jeff Banister said. "I think he did that tonight in three different at-bats." The Rangers, who have the best record in the American League at 86-59, improved to 14-3 against AL West rival Houston this season. Keone Kela (5-1) allowed one hit in two scoreless innings for the win and Jake Diekman pitched a perfect 12th for his fourth save. Evan Gattis hit a solo homer off Sam Dyson with one out in the ninth to tie it at 3. The towering shot, which landed on the train tracks atop the left field wall, was the 26th homer for Gattis this season. Marwin Gonzalez singled after that, but the inning ended when Colby Rasmus struck out and Gonzalez was caught trying to steal second base. "Sometimes the bounces don't go your way," Hinch said. "There's a lot of frustrating parts of this game, but none more so than the final score." Odor drove in one run with a ground-rule double in the Rangers' two-run first inning. His RBI single in the third made it 3-1. Texas starter Martin Perez yielded three hits and two runs with six strikeouts in 6 1/3 innings. 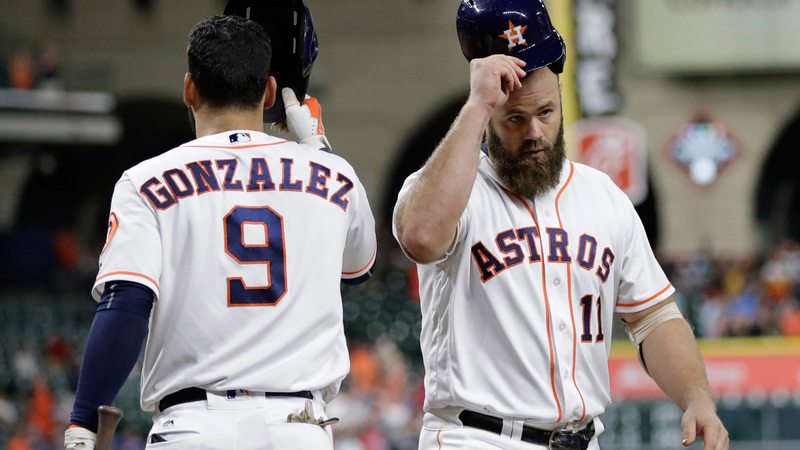 Gonzalez had an RBI single for Houston in the second and Tony Kemp's pinch-hit, ground-rule double got Houston within one in the seventh. Houston starter Doug Fister allowed six hits and three runs in five innings. He's had a tough September, allowing 25 hits and 17 runs combined in three starts. Astros rookie Alex Bregman went 0 for 5 with three strikeouts to end a 10-game hitting streak and Carlos Correa was 0 for 3 with a pair of walks to snap his hitting streak of 13 games. Astros: LHP Dallas Keuchel, who hasn't pitched since Aug. 27 because of inflammation in his left shoulder, will be shut down until at least Wednesday. Keuchel said they will decide then what his next step will be. Keuchel has had a tough follow-up to a 2015 season where he won a career-high 20 games and was voted the AL Cy Young Winner. Houston's ace is 9-12 with a 4.55 ERA. Monday was the first of 19 straight games the Astros will play against teams in the AL West to end the season. They have seven games remaining against the Angels, six with the Mariners and three against the Athletics. Elvis Andrus robbed Houston's Max Stassi of a hit when he dived to grab a low liner for the first out of the 10th inning. Andrus sailed through the air to make the catch, hit the ground and rolled over before holding his glove up to display the ball. Rangers: A.J. Griffin (7-4, 4.92) will start for Texas on Tuesday. Griffin looks to bounce back after giving up a career-high eight runs in four innings of an 8-3 loss to Seattle on Wednesday. Astros: Brad Peacock (0-0, 3.38) is scheduled to start his second game on Tuesday. He allowed five hits and one run in 3 2/3 innings of a 5-1 win against Cleveland in his first start this season on Tuesday.